What is Waldorf education? Does it matter when choosing a daycare? There are different theories on education, and different programs available to match those theories. On top of that, there are programs with combined components of multiple theories. For example, at Rainforest Learning Centres, we develop a custom curriculum that incorporates many theories on education. We believe this not only creates a balanced daycare and preschool program, but one that is able to glean the strongest parts of each of theory, without losing flexibility. But that’s just us! Each childcare centre will have its own qualities for you to consider. In early childhood education (i.e. namely preschool and daycare), there are a few popular theories you may have already heard about. Reggio Emilia and emergent curriculum are two that we’ve covered on this blog previously. Montessori is another. 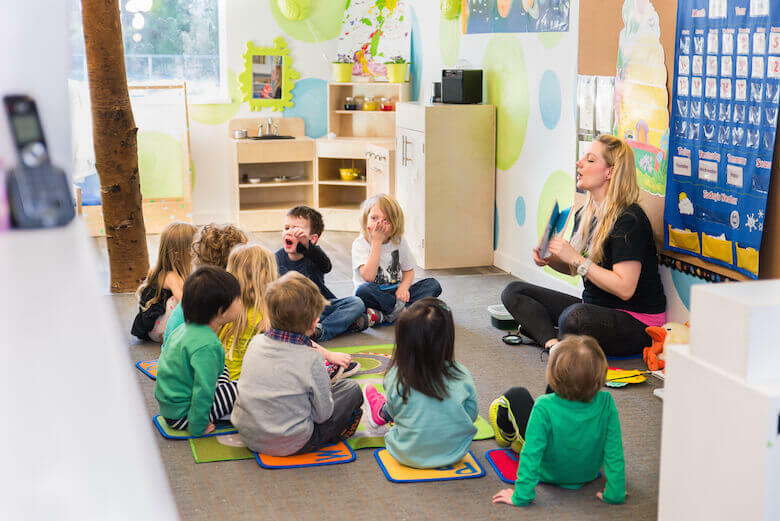 In this article, we’ll discuss Waldorf education and its points you may want to consider when deciding on a daycare or preschool program for your child. Keep in mind that Waldorf schools can also be called Steiner schools, named after the founder of the theory. We thought this is an important point to lead in with. This is because we realize many parents have sensitivities when it comes to any hints of religion in their child’s education. And that can be a deal-breaker for some. Nothing we say about this matter is meant to be negative, however – only informational. Waldorf theory of education is not self-claimed as a religious school system. However, it’s foundation and beginnings have roots in the occult, and in spiritual types of belief systems, particularly Anthroposophy, created by Rudolf Steiner. If you are familiar with New Age teachings or astrology, those may fall more closely in line with Waldorf beliefs than say, mainstream Christianity, Islam or Judaism. If you are looking for a completely secular daycare or preschool program, or one based on Western Christian tenets, then Waldorf education may not be for you. However, it isn’t always advertised this way, according to some reports (see links in this article). This has raised controversy. This has become a sensitive issue with some, as described in detail in this mother’s post. A main complaint in her article points out that while the claimed intent of a Waldorf school is to allow for self discovery within the child through guided direction by teachers, the end result (for her) was a very rigid, almost micro-managed system that quenched creativity instead of nurturing it. This was because while children did do art in the school, the art methods were limited at certain age groups, and were highly controlled. She later read that the art’s cause was based on achieving spiritual goals. These goals were related to the development of the child’s “soul.” This frustrated her daughter. It also made harmless items, such as felt markers, seem overly problematic. However, it’s important to note that the author above was trying to explain that it is the root philosophy of what Waldorf theory is based on, which presents the scientific teaching problems. It might not be that all classrooms in Waldorf schools teach in these ways (though it’s hard for us to say). This brings us to our next point. This is important to note: the premise of the Waldorf theory is that schools are run individually and by the full discretion of the direct educators (i.e. the teachers in the classroom or school owners). This means it would not be conventional Waldorf theory to have government oversight or political committees making decisions about what goes on in the classroom. However, there are now publicly-funded schools that use the Waldorf method to some degree, but still follow governmental rules for education (to continue receiving funding). That can leave things ‘open’ in a lot of Waldorf-based schools, where one may not choose to incorporate all aspects of the Waldorf theory. This also happens with other educational organizations that hang their shingles as say, a “Montessori” school. Just because it’s on the sign, doesn’t mean the daycare or school program follows or uses all Montessori material. And so, with Waldorf education, some schools may celebrate Christian or Jewish holidays, without trying to fall in line with one religion in particular. But the spiritual basis for the Waldorf method while teaching is still applied, since that is its foundation. The Waldorf theory of education is very artful. Art is seen as a way for kids to learn other subjects. Art here does not only mean painting or crafts. It can include music, imagination sequences and rhythmic exercises or movements (eurythmy). There can also be sewing or baking. In general it uses visual qualities to teach subjects. The type of art used is very purposeful and intentional, as this post explains with some examples of how a teacher can use Waldorf art in their own classroom. This may be an important consideration for parents when choosing a daycare. Waldorf educated children don’t learn to start reading until the age of around 6 or 7. This is supposed to correlate with the loss of baby teeth. Delayed reading is based on the belief that the child is not yet ready to grasp these abstract concepts until later years, at least not easily. It is also based on a belief about the natural development of human history, according to Steiner’s theories. Oral tradition and pictorial learning is emphasized in the early years, as a prelude to reading. It is also believed that delaying reading can turn kids into better readers and listeners. When you enter a Waldorf school, you will notice there may not be traditional toys made of plastic in the room. There will more likely be a lot of natural textures and materials, such as cloth, wood or clay (sometimes collected from outside by the kids themselves). Man-made toys are made to be simple to encourage imagination. A more detailed explanation of Waldorf toys can be read by Sarah Baldwin, a company owner who makes and sells them. While we have named some qualities of Waldorf education, we have by no means mentioned everything that makes the educational method distinct from others out there. We do encourage you to read more about the theory (our links in this article could get you started). You’ll find some interesting concepts, such as “looping,” which keeps the same teacher with kids for multiple grades. You’ll also find that their early childhood education classrooms are designed to resemble home environments. Multimedia and electronics are greatly discouraged in the schools. And the theory, overall, aims to educate children beyond academics, including social skills, health and self-discovery in its curriculum goals. Some of these aspects of the Waldorf movement may be appealing to you. That is likely why they may also seem familiar! Educational institutions can sometimes recognize the benefits of specific Waldorf concepts. Thus, they can be incorporated into other programs. If any part of Waldorf theory is important to you when choosing a daycare, you could ask a childcare centre if their curriculum incorporates some of those practices already, even if they are not labelled as a Waldorf-exclusive school.